Quality Garden sheds delivered erected and installed in London and Essex by Sheds Unlimited, manufacturers of bespoke garden sheds, chalet style sheds, cabins, garden offices and garden rooms. We can make your garden building to your own design! We Install Our Sheds Free Of Charge! At Sheds Unlimited we build garden sheds up to a high standard using good quality graded timber to ensure that your shed lives up to our reputation. Many companies build their garden sheds using cheap whitewood cladding which keeps their prices down but isn't as durable as the redwood pine that we use. Whether your requirement is for a garden storage box, a garden shed , a home office or a bespoke garden building, we exercise the the same care in providing your new garden shed or building as we would if it were going in our own garden.If you cannot find the garden shed or building that you require on this site then please give us a call or drop us a line. Have a look at some of the bespoke garden sheds and timber buildings that we have already completed, we can build your new garden shed exactly how you want it! Whether it needs to be a completely bespoke garden shed or just a small alteration to a design, we can do it. ALL INCLUSIVE PRICING* Our prices include delivery, installation, glazing, felting and base coat treatment. Providing that you have a suitable base for the shed to go on and your garden is accessible, we will erect your shed free of charge at the time of delivery. 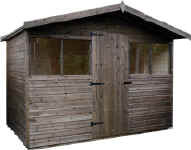 VALUE FOR MONEY We manufacture and install the garden sheds that we sell. You are dealing direct with the manufacturer, not paying a middle mans profit margin. 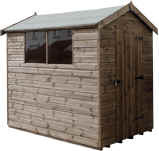 ASSURED DELIVERY When you order your new garden shed from us you agree a delivery date with us at the time of order. You are not left wondering when your new garden shed will turn up. CARE We employ humans to build our garden sheds, not machines. We train our shed makers up to a high standard, they know if a plank of wood has a knot or split then it shouldn't be used, so they don't use it. 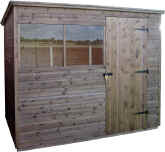 *We deliver and erect our garden sheds free within the Essex and East London areas. Delivery outside of that area may carry a surcharge. The area's we serve include Southend on Sea, Westcliff on Sea, Leigh on Sea, Rayleigh, Hadleigh, Chelmsford, Brentwood, Billericay, Wickford, Woodford Green, Chingford, Romford, Upminster, Chafford Hundred, Chelmsford, Colchester, and Braintree but we travel into London and further on a regular basis. For SHED BASES in Essex click this!! Sheds Unlimited deliver and install garden sheds, log cabins, summerhouses and garden offices in the Essex, Suffolk, Kent, West Sussex, Hertfordshire, Surrey as well as Inner and Outer London. Our service includes delivery, erection, treatment, glazing, timber floor and felted roof. You are required to provide us with good access and a suitable base for your new shed to be erected on. Failure to provide good access means that we will have to deliver the shed to the most convenient alternative place for you (sorry, but if we can't get the shed safely into your garden then we can't put it up). In the event that your base is unsuitable for your new shed to go on you will be advised of such and the shed will be erected on that base at your own risk, you will be required to sign the delivery note to that effect. Sheds Unlimited are unable to provide any kind of warranty if a shed is erected on an unsuitable base at your insistence. We will make a return visit to erect your shed if you request us to, the cost for this additional service is on a case by case basis dependant upon location.